Five layers of clothing. And a buff around my neck. Wool socks, a ski hat and winter gloves. All topped with a heavy down jacket. It’s my daily attire. Just enough to keep me warm. 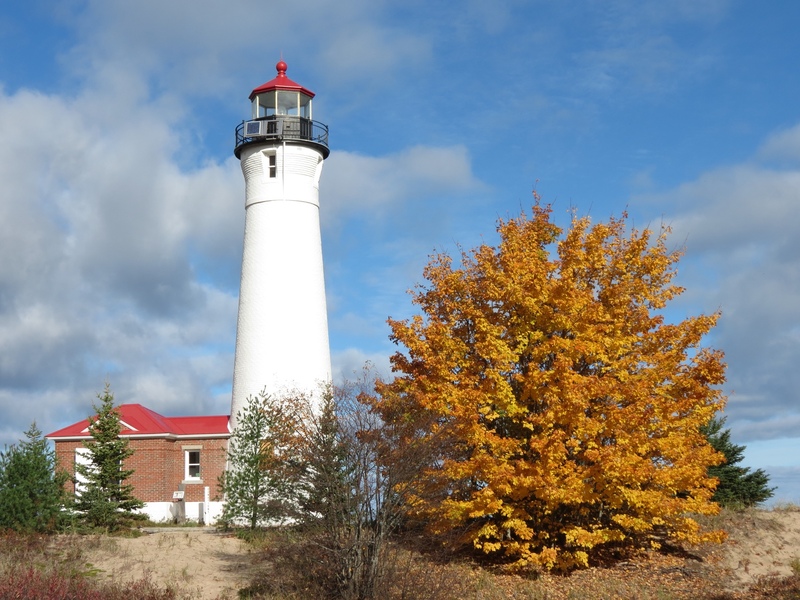 I stand in the Crisp Point Lighthouse Visitor Center manning the gift shop. With temperatures in the 40s the cement walls are welcome shelter, but lacking any heat source the building does nothing to aid my cause. Gentle shivers involuntarily rack my frame as I strive to maintain body heat. I fear I’m losing the battle. But I am determined to muster on. Visitors regard us with a mix of incredulity and awe. “That your tent out there?” they ask as they shiver in sympathy. They too are outfitted in winter gear. I answer with a grin and a touch of macho pride, “Yes, and it’s the warmest place around.” They are mighty grateful we are here, keeping the lighthouse open for them. And honestly, we are happy to do it. We quickly learn to manage. Nothing generates heat like exercise. So I escape for an energetic run each afternoon and relish shedding hat and gloves as I go. I return with enough residual heat to handle a cold sponge bath. Rich follows suit riding the sand on a fat tire bike. A hot meal goes a long way, warming our innards. 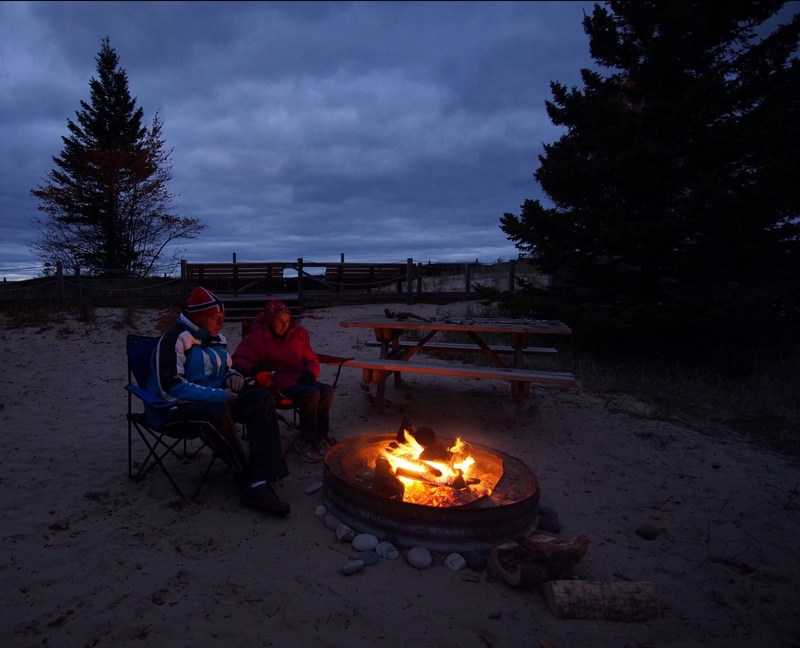 Followed by a blazing campfire, evenings are quite comfortable. Crawling into my down sleeping bag at night I feel the warmth immediately radiating around my body. My little cocoon keeps me toasty all night long, nestled into the soft sand. I wasn’t kidding about the tent. With fresh reserves of heat I’m primed for sunrise. I feel impervious to the wind and cool air as I search out the best vantage points for the morning light show, followed by a brisk walk down the beach. This is my favorite time of day here. Even in October. By the end of our five days we are coping well. More than that, really. Continue to love it here. 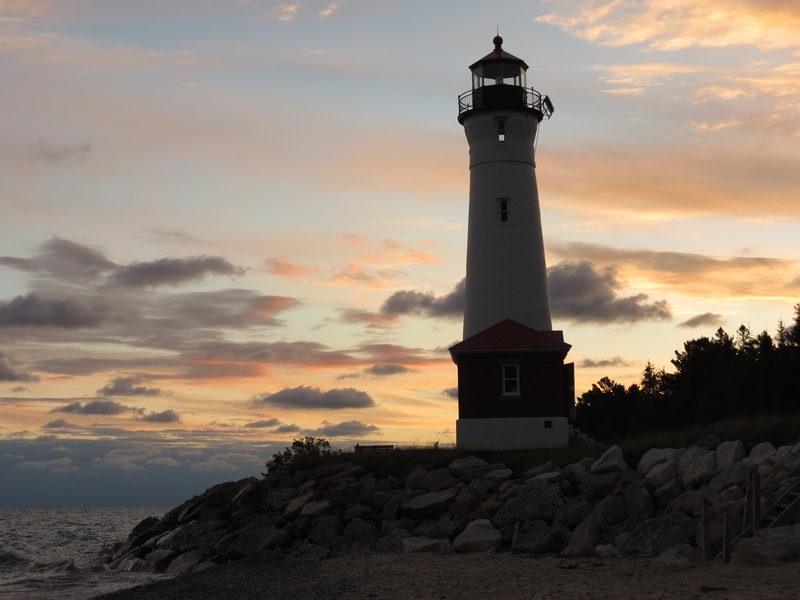 I miss the warm days when I could sit on the beach and write, or nestle up on the lighthouse cat walk to read. But it’s still a privilege to claim this remote beauty as home for a spell. Good thing. We’ve signed up to return next October. To chill out. Fall leaves have been a tease this year. 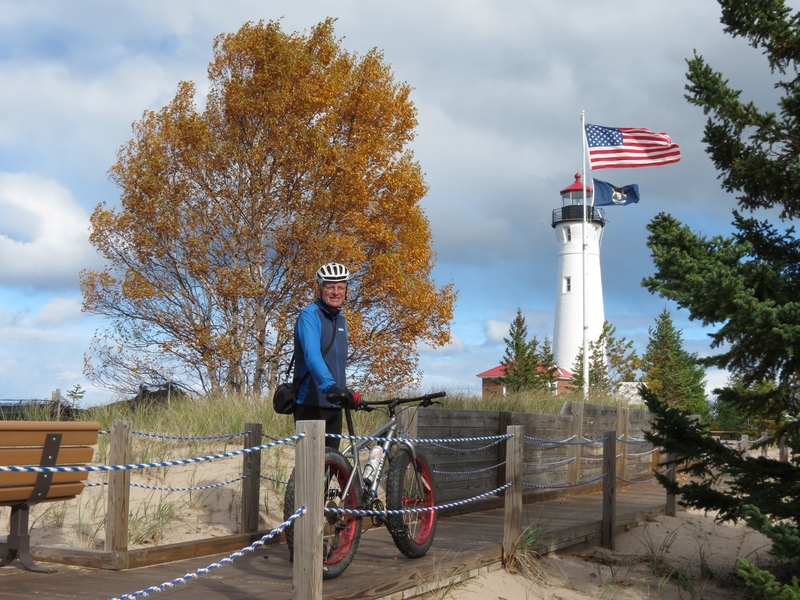 Throughout September and the early part of October we cycled through upper and lower Michigan amid scattered fall colors. Leaves were just beginning to turn, surrounded by their green neighbors. Isolated pockets of color delighted us. But it was only a hint of what was yet to come. That was actually a blessing for us. 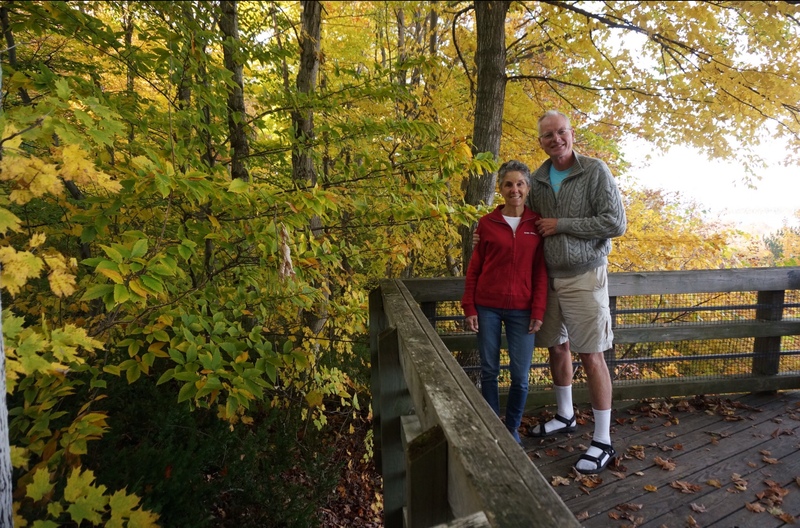 We deliberately planned to miss peak leaf season due to the tourists it attracts. 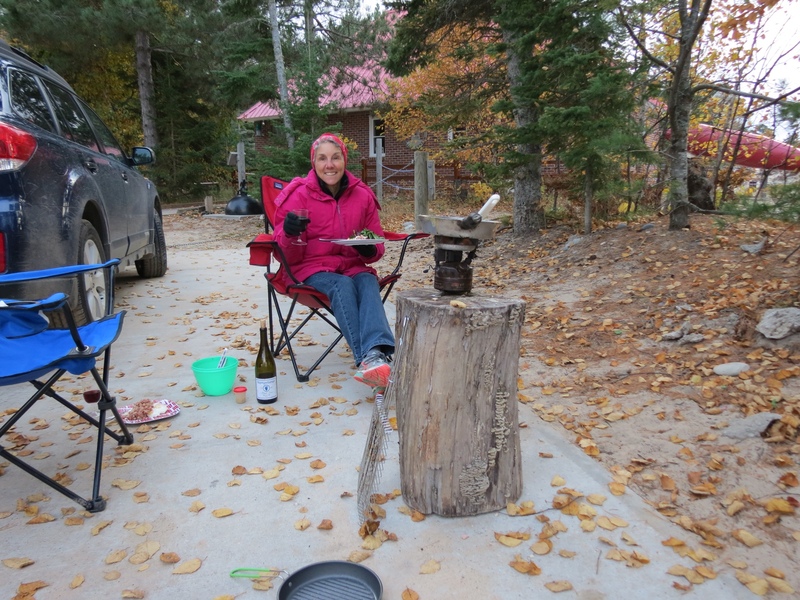 We had no desire to cycle crowded roads or fight for motel rooms populated by leaf peepers. So we took pleasure in seeing the mild nascent display. 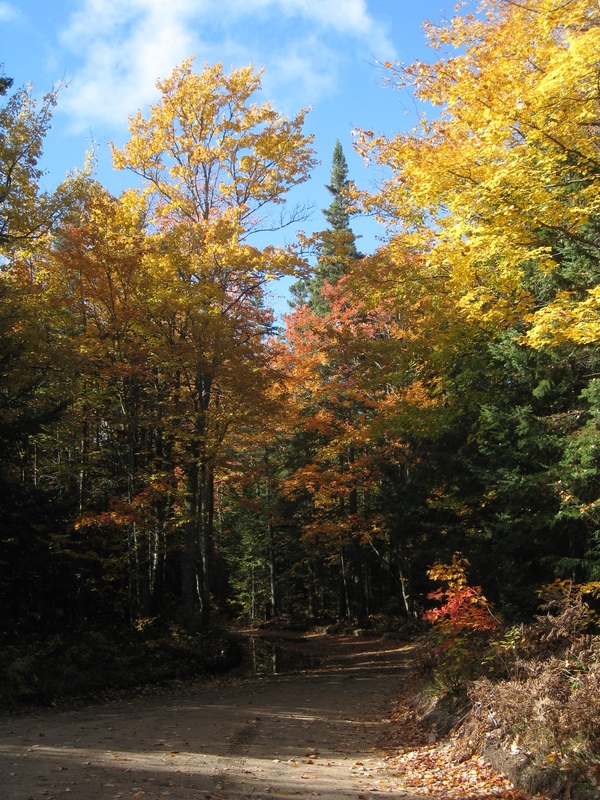 Returning home to the Northland, it was no surprise that the leaves were past peak. 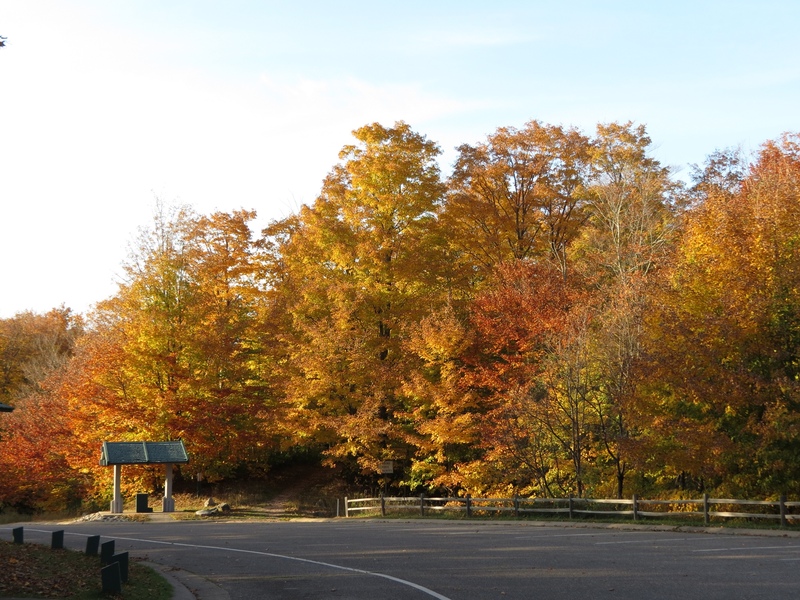 Color remained, but many trees were already bare. 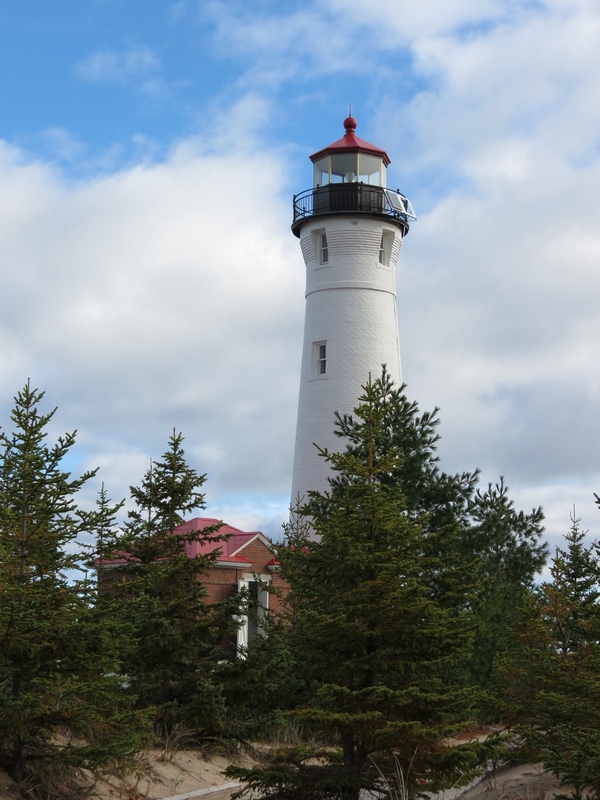 So we expected nothing more when we drove through the UP to Crisp Point Lighthouse. Nature had a gift for us this time, and we traveled a shoreline of brilliance. 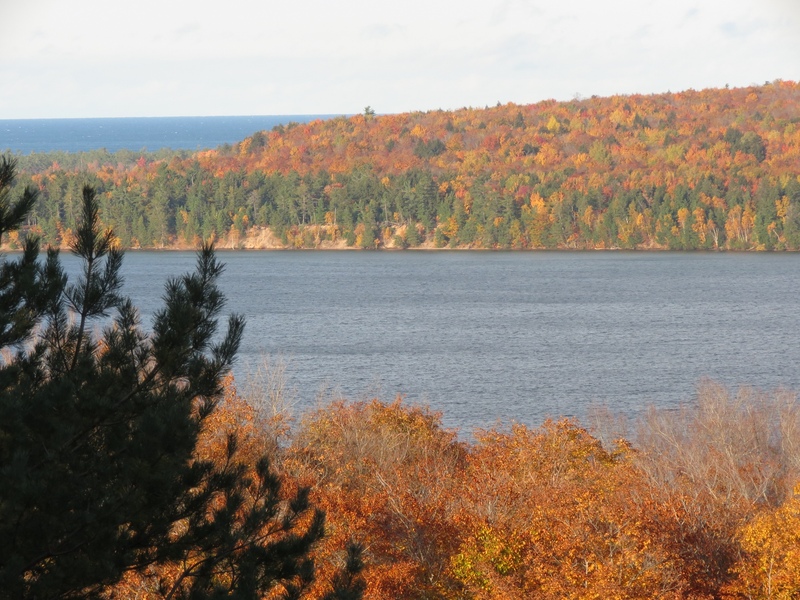 Trees at their finest blanketed the countryside and adorned the lakefront. 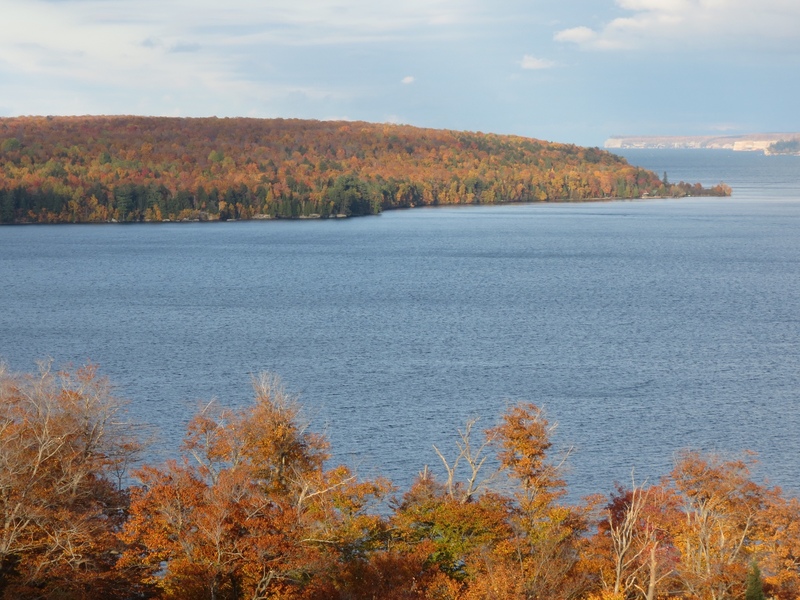 Stopping at the overlook in Munising provided a fine view in the late afternoon sunlight. 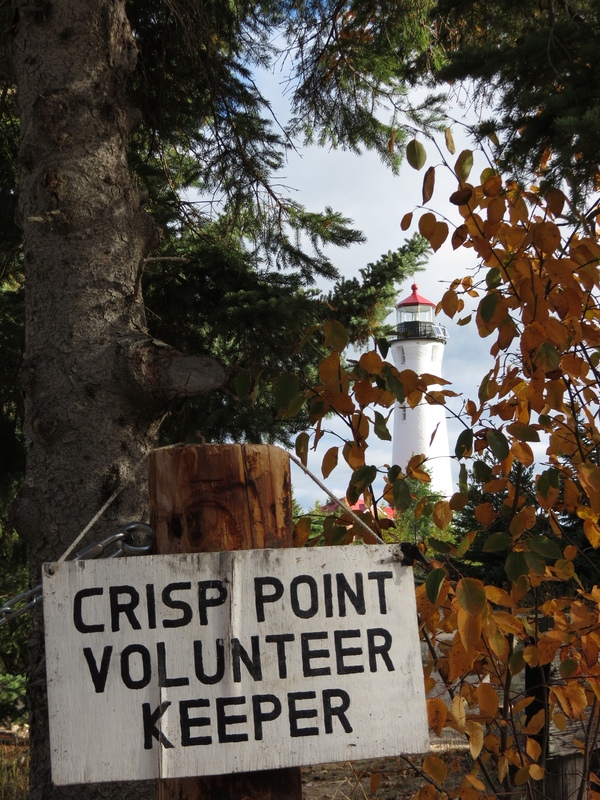 The road into Crisp Point Lighthouse is notorious for being rough. 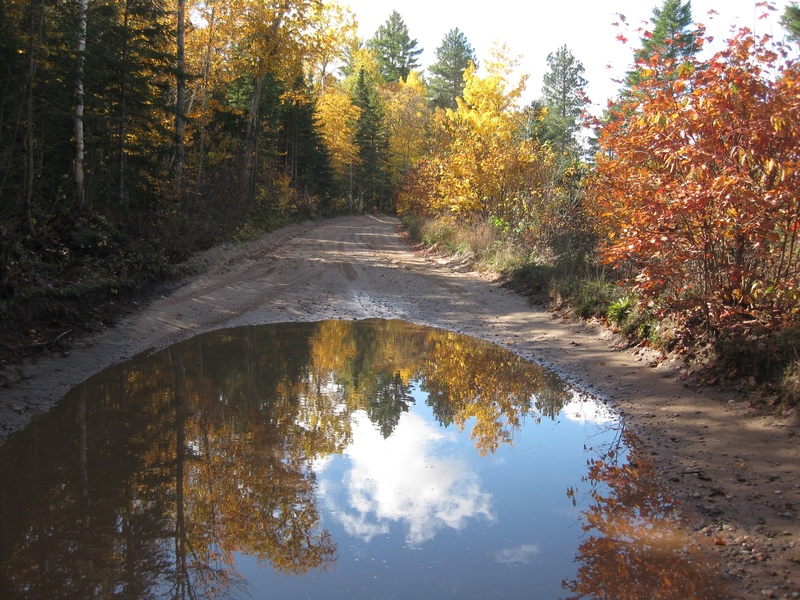 Its 18 miles of dirt road is susceptible to potholes, washouts and bumps. 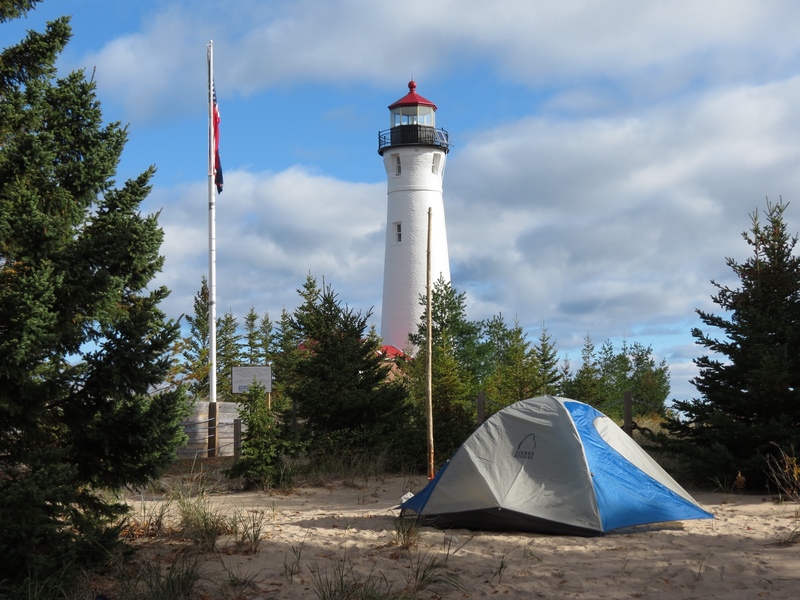 You have to really want to see the lighthouse to make the trip. This fall the area saw unending rainfall, resulting in flooding on the road. 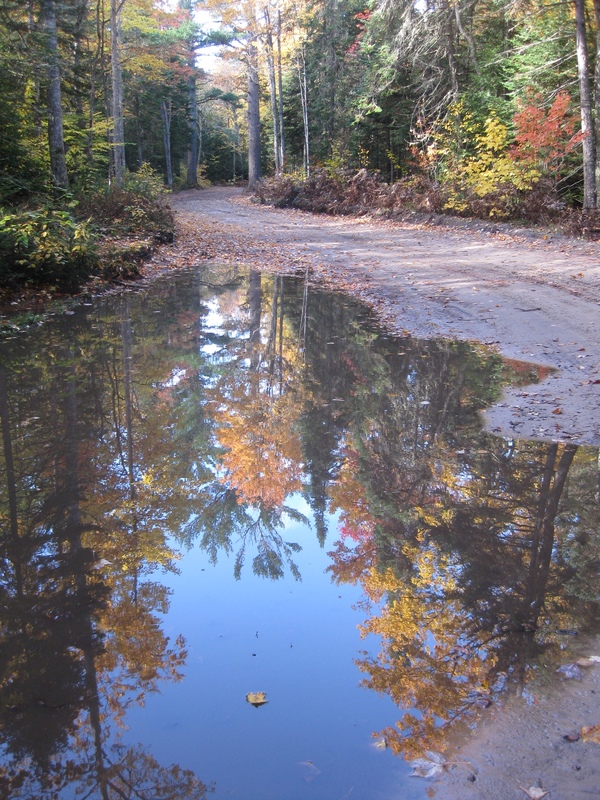 We encountered numerous puddles that stretched the full width of the road, daring us to cross. Navigating them tentatively at first, we gained confidence with each one and ultimately plowed right through. For everything that road delivered in adventure it compensated with beauty. By the time I went for a run in the afternoon, the pools had become reflecting ponds and the colors popped against a deep blue sky. 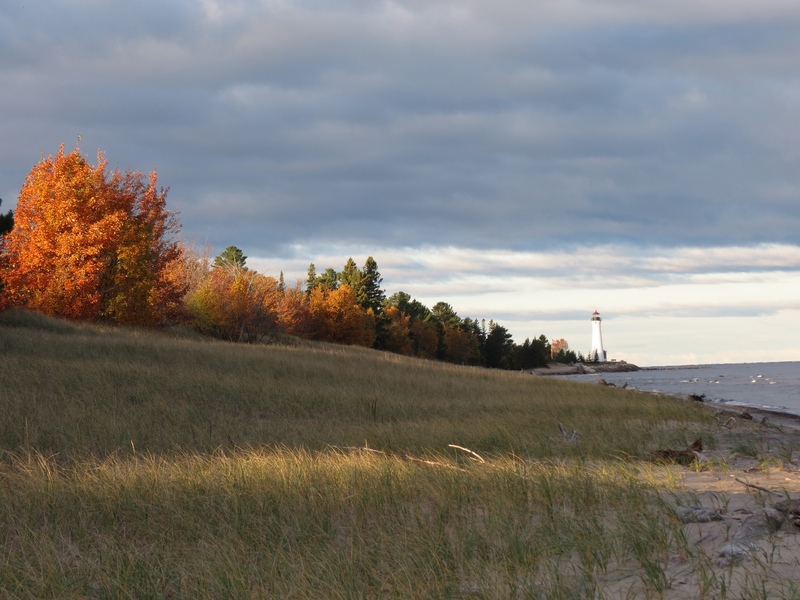 Catching the colors against the lighthouse required patience and the right angle. But the chase was half the fun. My autumn is now complete. I found fall colors after all. Where I least expected them.